Geodiversity is an appropriate term in Central Wales, as it describes the great range of geological, geomorphological and associated features in the region. We have a rich heritage in our rocks and landscape which tells the fascinating history of the evolution of the region spanning more than 700 million years of geological time. This evolution extends from the late Precambrian, through the Palaeozoic, Mesozoic and Tertiary, into the more recent glacial events of the last 2 million years and on to the present day. 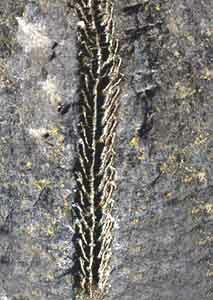 Left: fossil graptolite, 3cm in length, of early Silurian age (about 440 million years old), from Central Wales. Our fossils are just one part of the geodiversity of Central Wales. Much of Central Wales is made up of Ordovician and Silurian marine sedimentary rocks, deposited in the Lower Palaeozoic Welsh Basin when Wales, as part of Avalonia, lay beneath a shallow sea on the SE side of the great ocean of Iapetus. On its far side lay Scotland and Northern Ireland, both part of the continent of Laurentia. The rocks laid down in the Welsh Basin are dominated by sequences of sandstone, siltstone and mudstone. Many of these sequences are referred to as turbidites, because they were deposited from turbulent, sediment-laden submarine currents, which flowed off the shallower shelf areas onto the deep floor of the basin. Volcanic activity took place locally, notably in the Welshpool and Builth Wells areas. This activity produced basaltic lava flows and dolerite intrusions, some of which have been quarried for building stones and aggregates. Above: CCW geologist Bob Mathews examining sandstone bedding-planes with current markings, typical of those seen within turbidite sequences, at New Quay on the Ceredigion coast. The Welsh Borderlands were situated on the margin of the Welsh Basin during Lower Palaeozoic times. This part of the basin was a shallow, warm shelf sea, teeming with life. Fossiliferous limestones, deposited in this sea, are now exposed in several areas hereabouts and are today quarried for aggregate and lime. They contain the remains of its inhabitants, such as trilobites, brachiopods, bivalves and corals. The deeper water turbidite-dominated sediments occurring farther to the west are less obviously fossiliferous, but shale bands contain remains of free-swimming and drifting organisms such as graptolites, which sank to the sea-bed after they died. Left: a view of part of Strinds Quarry, near Kington in the Welsh Borderlands. Light-coloured Silurian limestones here lie unconformably on darker Precambrian sandstones and shales. The rocks of the Welsh Basin were deformed by the Late Caledonian (or Acadian) earth-movements as Iapetus closed and Avalonia collided with Laurentia, some 410-400 million years ago. One result was the folding of the Lower Palaeozoic rocks; another was the development of a strong cleavage in mudstones, which locally provided the raw material for the slate industry. Regional scale folds in Central Wales include the Berwyn and Plynlimon domes, whilst trains of small folds are commonly seen in road-cuts and coastal sections. These structures record the deformation that accompanied the shallowing and final silting-up of the Welsh Basin in Devonian times. 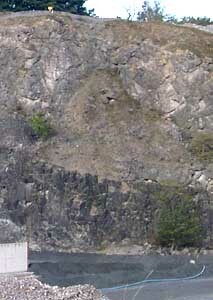 Above: folded sedimentary rocks, of Silurian age, exposed at Hendre Quarry in Ceredigion. 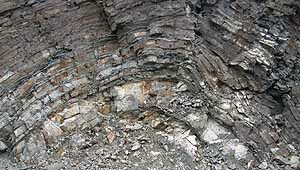 The folding records an episode of continental collision that brought an end to marine conditions in Central Wales during Lower Devonian times. In the Brecon Beacons, the Silurian-Devonian Old Red Sandstone records the environmental change from marine to terrestrial conditions as the Welsh Basin silted up. The environment was arid but it also featured braided streams flowing into lakes in which primitive fish lived. 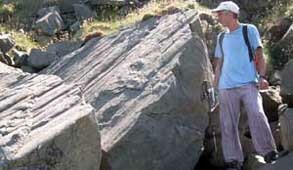 Sedimentary rocks of this age, exposed in southern Powys, contain fossils both of the fish and also examples of some of the earliest known land plants. The distinctive red soils of the area indicate that the underlying Old Red Sandstone was deposited in desert environments in which iron-bearing minerals were readily weathered to reddish oxides such as hematite. 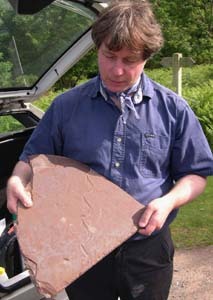 Left: Duncan Hawley, of Swansea University, with a slab of Old Red Sandstone showing a zigzag trail made by a primitive fish on the bed of an ancient lake. Carboniferous rocks cap the Black Mountains and also occur in the extreme NE of our region, where they are succeeded by Permo-Triassic desert sandstones. A thick sequence of Jurassic marine sedimentary rocks occurs beneath the seabed of Cardigan Bay, where a sedimentary basin existed during Mesozoic and Tertiary times. The existence of this basin was confirmed by drilling in the late 1960s. Onshore, however, there is a stratigraphic gap in Central Wales which spans much of the Mesozoic and Tertiary. 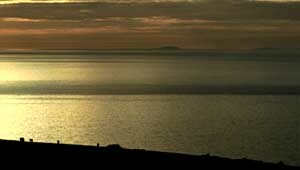 Above: Bardsey Island and the Lleyn Peninsula, seen across Cardigan Bay from the Ceredigion Coast. A large part of the Bay is floored by Mesozoic and Tertiary rocks. The Central Wales Orefield, situated in N Ceredigion and NW Powys, was worked for lead, zinc, copper and silver from Bronze Age times until the mid 20th Century. The mineral veins were formed during several phases of hydrothermal activity from Devonian to Permian times. Today, the most important mines are being conserved by several organisations. The contribution of mining to our cultural legacy is being publicised and promoted through the Ceredigion Uplands Mining Heritage Project, `Spirit of the Miners'. Left: Cwmystwyth Mine in eastern Ceredigion has a long history extending back to the Bronze Age, over 3500 years ago, when copper mining took place. 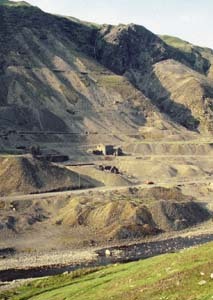 The mine saw many phases of working, with lead, silver and zinc being extracted during its most productive phase in the 19th Century. The mineral veins of Central Wales contain a lot more than ores of copper, lead, silver and zinc. There are compounds of cobalt, nickel, antimony, arsenic, cadmium, barium and even traces of gold. These include some internationally rare mineral species among the more familiar ones. Weathering of the metal ores has led to the formation of many brightly coloured secondary minerals, for which the mines have long been visited by amateur and professional mineralogists researching the processes that led to their formation. 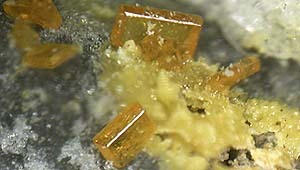 Above: orange crystals of the secondary lead molybdate mineral, wulfenite - just one of many interesting minerals found at minesites in Central Wales. One legacy of the Central Wales mining industry is the pollution resulting from acidic, metalliferous minewaters. The pollution occurs because sulphide minerals tend to be unstable in the presence of air and moisture. 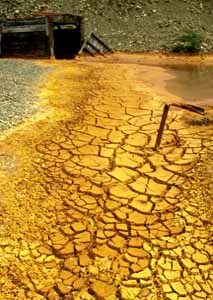 The oxidation process creates sulphuric acid, which then digests other minerals, resulting in the mobilisation of a range of potential pollutants. Tackling the various aspects of pollution at mines is a difficult job which is largely undertaken by the Environment Agency. Left: the entrance to No. 9 Adit at Cwmrheidol mine in 1992. Ochre (yellow iron oxide) and highly acidic minewater are present, both having formed by the weathering of marcasite, an unstable iron sulphide which is abundant at this site. Our landscape is thus the product of many processes acting over many millions of years. One of the most significant events to affect the landscape was a series of ice ages. Approximately 2.4 million years ago, the Earth's climate began to fluctuate between cold intervals (glaciations), some of which lasted up to 100,000 years, and interglacial periods during which temperatures were similar to or even warmer than those of today. During the glaciations, large ice-caps formed on the Welsh mountains and glaciers occupied the valleys. The glaciers carved deeply into the rocks to give the landscape its now familiar appearance. 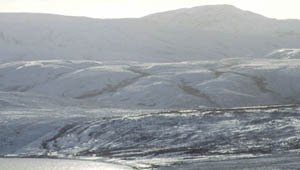 Above: winter on Plynlimon - a landscape created by glacial ice which left the area about 14,000 years ago. Throughout the region there are `humps and bumps' in the landscape, geomorphological features that record erosion and deposition by glaciers during the Quaternary Period, such as the moraine ridges and cwms of the Brecon Beacons. Cryogenic structures, such as pingos formed by ice pushing up through soil and melting to leave depressions, are found near Tregaron and elsewhere. These glacial and other periglacial (cold-climate) features are all part of our Geodiversity, as are the traces of Quaternary rivers, lakes and the soils which formed in that period and have evolved through to the present day. 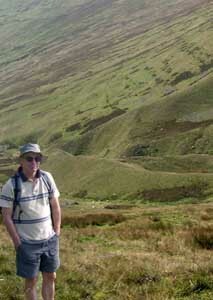 Left: Quaternary geomorphology specialist Rick Shakesby, of Swansea University, on fieldwork in the Brecon Beacons, studying morainic ridges which can be seen in the background. But we don't stop there: many of our rocks have been found to be useful for building castles, mansions and churches in Central Wales, so Geodiversity merges with archaeology and cultural activity. The identification of the source of the stone from which an important building has been constructed is a factor to be considered when undertaking restoration projects. One of the roles of the Welsh Stone Forum is to undertake such work throughout Wales. 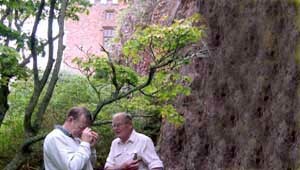 Above: Tim Palmer and Richard Cave examining a rock sample at Powis Castle, near Welshpool. The rock face beside them consists of the Powis Castle Conglomerate, of Silurian age, from which the castle above was constructed. Not to be overlooked is the human face of Geodiversity in Central Wales. Two of our `old girls' are Gertrude Elles and Ethel Wood who, more than a century ago, used graptolite fossils to unravel the time sequence of Lower Palaeozoic rocks in Wales and to establish principles now applied globally. Another is Nancy Kirk, recently departed, who brought graptolites to life with intricate and elegant models and her use of simple and inelegant language! Among our `old boys' are Murchison who put the Silurian on the map nearly two hundred years ago, and O.T. Jones who first made sense of the Welsh Basin (`geosyncline') and placed the Central Wales Orefield on record in many publications and on the basis of enormous amounts of fieldwork over 40 years in the first half of the 20th Century. 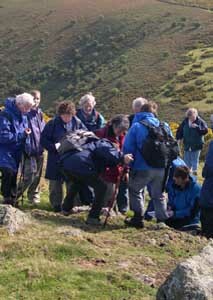 Left: a geological field party on Hanter Hill, where there are exposures of Precambrian igneous rocks dating back to over 700 million years old - the oldest rocks in Wales!